A right angle is 90°. Pythagorean triples are three whole number sides that form a right triangle. In one such triangle, 54-72-90, the longest side, 90, is opposite the 90° angle! 90 is a composite number. 90 = 1 x 90, 2 x 45, 3 x 30, 5 x 18, 6 x 15, and 9 x 10. Factors of 90: 1, 2, 3, 5, 6, 9, 10, 15, 18, 30, 45, 90. Prime factorization: 90 = 2 × 3 × 3 × 5 which can also be written 2 × 3² × 5. 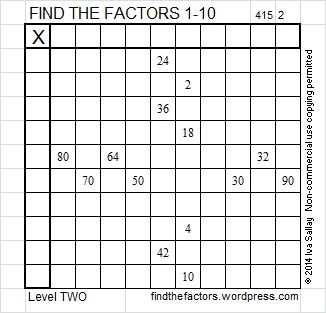 Sometimes 90 is a clue in the FIND THE FACTORS 1 – 12 puzzles. 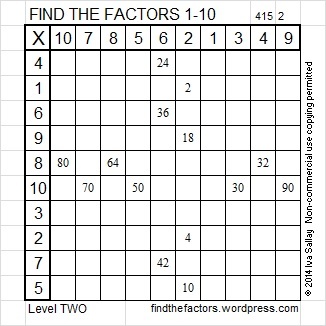 Even though it has other factors, we only use 90 = 9 x 10 in the puzzles.